View More In Jewelry Boxes. Halcyon Days, Christmas 2017 Dove of Peace Enamel Box w/Inside Inscription, Gift Box. Handmade with 24K gold fittings. Imported from Great Britain. This is the 44th edition in the series; as such, the intricate design continues, as its predecessors did, to epitomise the festive season. Gold plated and hand decorated, the delightful design of this enamel box depicts a mystical Christmas snow scene at night. 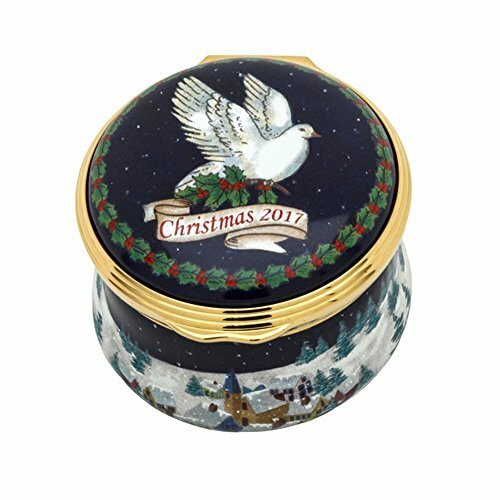 The lid features an illustration of a dove bearing a branch of holly and ivy with the words "Christmas 2017' decorating the surface. The inside lid is thoughtfully inscribed with the words, 'Peace on earth will come to stay when we live Christmas every day'. Individually handcrafted by the Halcyon Days' artisans, these exquisite enamel boxes are renowned around the world for their beauty and artistry. Gifts that will be treasured and adored for generations they are simply objets d'art. Each enamel box arrives beautifully packaged in a Halcyon Days festive red gift box. If you have any questions about this product by Halcyon Days, contact us by completing and submitting the form below. If you are looking for a specif part number, please include it with your message.